Here is mine. There are some common ones in here. I’ll try to pick out the more unique ones. I don’t need to tell you why I use Messages or Safari or Spotify. Siri is not great and I use voice when I can. When it works it’s magic. When it doesn’t I think about how dumb technology is. Google’s voice recognition is superior. I wish I had it globally on my phone. More on that later. Being able to type “Lunch with Bob next Wednesday” and have it understand me has been huge. The other pieces in the app are pretty standard though I do like their Today widget as well to allow me to see what’s coming up in the future. 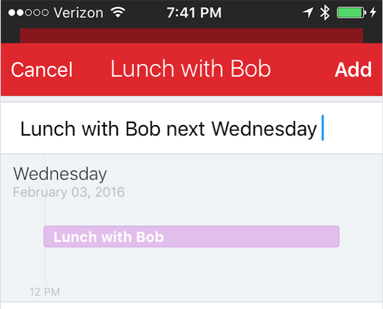 Fantastical knew that lunch is at noon and that “next Wednesday” is Feb 3. The best weather app out there. It gives me a weather report every morning. It tells me when it’s raining and when it stops. It only shows the important pieces of weather. I wish there was an API so I can do something with the various notifications. Mailbox by Dropbox is dead and I’m trying different mail apps. I was on Outlook. I stopped that. I’ve landed on Inbox because of its Snooze function. You can snooze messages for a time OR a place. It’s convenient that it tries to offer replies which makes it a zero mind-processing effort for most messages. It somehow knows how to respond most of the time. 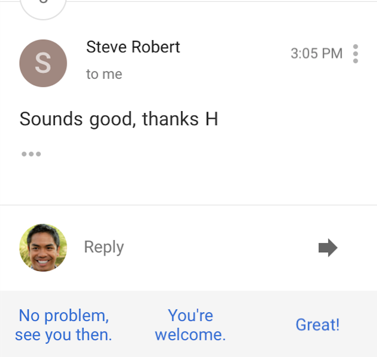 Google Inbox guesses quick responses with decent accuracy. Me and my wife use this. We have kids and need to coordinate as we’re both running around during the day. This app only works out if you mostly trust that you or your wife won’t use it for evil. It’s like Evernote. I don’t know if I’ll keep this. (See what I did there?) — I’m using that because it works well with Google Inbox for keeping notes and reminders. I think Google Keep will shut down eventually but I’ll use it for now. 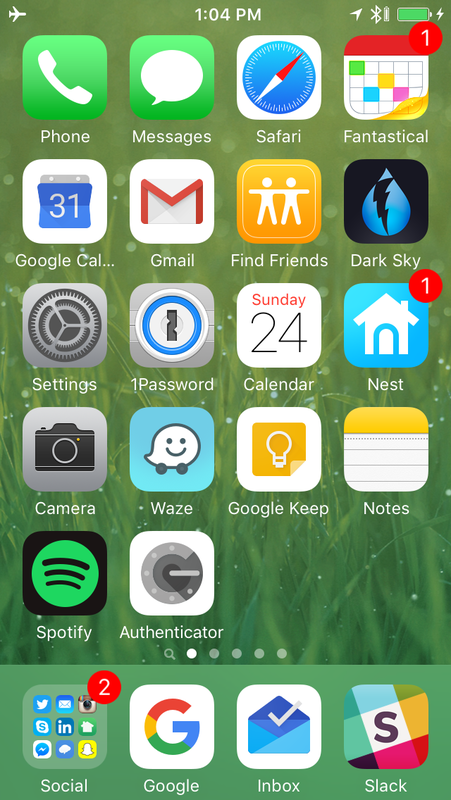 I’ve setup this driving app with my Google Calendar. I’ve also been more conscious of putting a destination address in my calendar. I used to have to copy or paste or search an address while on the road. Now it’s all there. It sets my house temperature to what I want when I get home. My wife usually gets home before me and cranks it too high. She said I can set it to whatever I want when I get home. So now it does it automatically based on when I enter my home. Don’t tell my wife. I still check Facebook way too much. But moving Facebook to a second page and turning off notifications has been a good experience. The days have been less distracting. I’ve depended on Google services for a very long time. Google is starting to tie all of their apps together to make their offering stronger. Aside: I’m thinking of switching from iPhone to Android. Using text input for search has been my main way to find other apps. I’m trending toward apps that understand either voice or text. Language is the Human API and we’ll see huge steps this year in applications using natural language processing. They should make home screens contextual based on location. I use different apps at home than I do at work. My question to you: What other apps should I be trying? To share your thoughts: Email or Twitter. Thanks to Eric Jorgenson for reviewing versions of this post. And thanks to Michael Simmons for making Fantastical. If you liked this, check out my post on 4 Predictions for 2016 Everyone In The Industry Should Be Thinking.